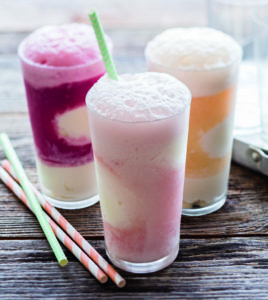 Ice cream soda is a classic summertime dessert for good reason. 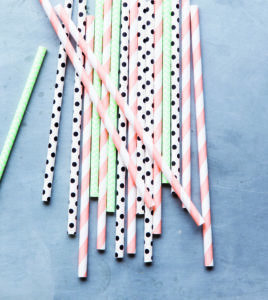 It’s cold, it’s fizzy. It’s sweet. It’s creamy. There’s so much complexity of flavor, and yet it’s so easy to make! If you’re going to try making this creamy concoction yourself, you’ve obviously got to go all out (and over the top), so the recipe below includes directions for homemade ice cream, whipped topping, and mix-ins. You can of course buy similar versions of these ingredients at the store, but then you’re missing out on half the fun! To make the ice cream, in a heavy saucepan, combine the cream and milk. Warm over medium-high heat, stirring occasionally, until the mixture barely comes to a simmer, about 5 minutes. Meanwhile, in a heatproof bowl, combine the egg yolks, sugar, cocoa powder, and salt. Whisk vigorously until the mixture doubles in volume, about 2 minutes. Remove the cream mixture from the heat. Whisking constantly, slowly pour about 1 cup of the warm cream mixture into the egg mixture and whisk until smooth. Pour the resulting egg-cream mixture back into the saucepan, whisking constantly, and place over medium heat. Add the chopped chocolate and vanilla to the saucepan. Using a wooden spoon, stir until the chocolate melts and the mixture forms a custard thick enough to coat the back of the spoon, 1–2 minutes. Do not let it boil. Meanwhile, set up an ice bath in a large bowl and nest a smaller heatproof bowl inside. Pour the warm custard through afine-mesh sieve into the smaller bowl; stir occasionally until cool. Remove the bowl from the ice bath and cover with plastic wrap. Refrigerate until very cold, at least 4 hours or up to 3 days. Pour the cold custard into an ice cream maker and churn according to the manufacturer’s instructions. 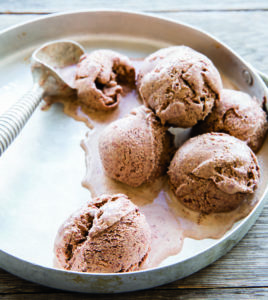 Spoon the ice cream into a freezer-safe container and place parchment or waxed paper directly on the surface. Cover tightly and freeze until firm, at least 2 hours or up to 3 days. When ready to serve, top with flaked sea salt, if using. To make the hot fudge sauce, in a small, heavy saucepan, combine the cream, corn syrup, and brown sugar. Bring to a boil over medium-low heat, stirring occasionally until the sugar dissolves, about 5 minutes. In a heatproof bowl, combine the chocolate and salt. Pour the hot cream mixture over the chocolate and stir with a silicone spatula until the chocolate is melted and smooth. Stir in the vanilla. Use right away, or let cool, cover, and refrigerate for up to 6 days. Reheat gently over low heat before serving (you may need to thin it with a little cream). To make the whipped cream, in a deep bowl, combine 3⁄4 cup well-chilled heavy cream, 2 tablespoons sugar, and 1⁄2 teaspoon vanilla extract. Using a mixer on high speed, beat until the cream is billowy and soft peaks form, about 2 minutes. Cover and refrigerate until ready to use. To make the brandied cherries, in a saucepan, combine the granulated and brown sugars, lemon zest, vanilla bean pod and seeds, allspice, salt, and 3 ⁄4 cup water. Bring to a boil over medium-high heat, stirring occasionally until the sugar is completely dissolved and the mixture becomes more syrupy, about 5 minutes. Remove from the heat, add the cherries, brandy, and vanilla and let stand until cool. 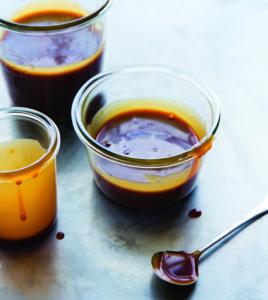 Transfer to a jar, cover tightly, and refrigerate for at least 3 days before serving. The cherries will keep refrigerated for up to 6 months. 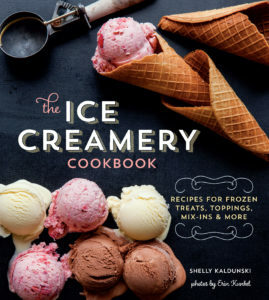 To purchase a copy of The Ice Creamery Cookbook, click here to find it on Amazon.